7am to 5pm Monday to Friday. Saturday appointments 8am to 10am. 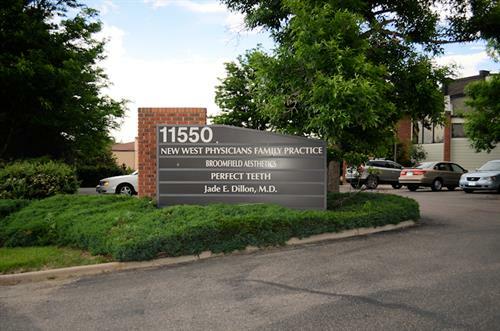 New West Physicians Broomfield is a Family Practice with 4 physicians, 3 Physician Assistants, male and female physicians, serving newborns to senior citizens, OB care, Aesthetics and Skin Care. Located near 120th and Sheridan. Our mission: To enhance the physical, mental and spiritual health of communities we serve through an integrated, primary-care owned and patient-centered health care delivery system. Founded in 1994, our organization is one of the largest physician-owned primary care physician groups in our state, with 17 locations throughout our metro area (population 3 million). We employ an integrated team of board-certified family practice and internal medicine physicians, dedicated hospitalists who work at our five contracted hospitals, physician assistants and nurse practitioners (97 providers), as well as behavioral health clinicians and full-time psychiatrists. From 120th and Sheridan, go south on Sheridan to 115th, make a U turn going north on Sheridan, we are the 1st building after the waterfall on the east side.